This spring Samsung is launching a whole slew of new Ultra HD/4K TVs, curved TVs, and even a line of curved UHD TVs. But televisions are just one aspect of a great home entertainment system. You also need some good-looking speakers and soundbars to round out the experience. 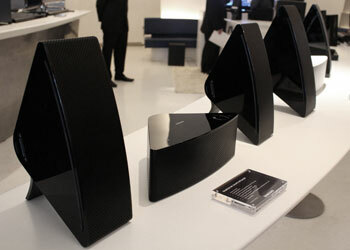 Samsung has this part covered with their new home audio offerings. Are they as exciting and want-inducing as those sleek new curved TVs? 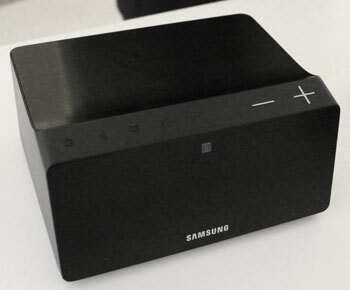 If you're looking to build a multi-room audio experience in your home, check out the Samsung Shape M5, a smaller version of the wedge-shaped M7 introduced last year. Similar to Sonos speakers, you can wirelessly connect multiple M5s and M7s so your music follows you from room to room. They come equipped with WiFi, Bluetooth, and NFC, and are controlled with an Android app. You'll be able to play music from multiple sources, including radio apps, your own music collection, Spotify and more, at a tap. You can also build multi-channel audio into a single room and connect to more sources for audio, all without latency. The Shape speakers, which come in white and black, are attractively designed to blend with or at least not detract from most home aesthetics. They work lying flat, on their sides, or mounted to the wall--whichever fits your needs best. And the only cord is the power cord; every other connection is wireless. Samsung is also looking out for you old-school home entertainment buffs who still have some legacy equipment around such as turntables, tape decks, CD players, and other analog devices. This spring the company will release the Link Mate, a box with multiple analog connections on the back that works just like any other source in the Mulitroom Link ecosystem. Just imagine the warm tones of vinyl beamed through your house to any Link-enabled speaker you own. 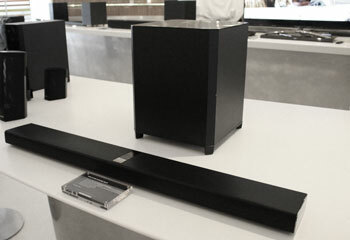 Speakers like the Samsung HW-H750 Soundbar and wireless subwoofer. This 320W soundbar will not only boost your TV's audio, it will also play music from your tablet, smartphone, computer, or any other device with Bluetooth. And because it's Multiroom Link compatible, you can play music through it from any source in any room or connect it to the Shape speakers and build up a multi-channel surround audio paradise one speaker at a time. We got a chance to hear all of these products at Samsung's showcase in the Guggenheim Museum here in New York, and even in a noisy room with average acoustics, the quality of the sound was evident. Particularly the setup with multiple M5 and M7 Shape speakers in a surround configuration. Since the speakers don't require multiple wires, it’s easy enough to place them where you want in any room to achieve the desired effect—and move them around again if you add on new ones over time. And, with a 2014 Samsung Smart TV, setting up those speakers for a surround system is as easy as pairing them with the TV—no receiver required. The new Shape M5 speaker is available for $299 on Samsung.com (the Shape M7 is $349 on Samsung.com, or $347 on Amazon). The H750 Soundbar is available now for $800 ($597.99 on Amazon). The Link Mate will come out later this spring.